So the Falcon Heavy launch was a success today and with that a commercially viable system for space exploration has been launched as well. This is a great feat and a big step towards a more economic space launch system than before. In the long run, this will make space exploration a bit more environmentally friendly and that is a nice addition as well. The reason to why this is a such a big step forward towards space tourism and potential colonization of the moon and maybe Mars is because of the many applications a system like this will have. The main reason is because it has the potential to be cheaper for the customer to use but it is also an investment with a potentially huge payback for Spacex. Imagine having to buy a new car after each costumer as an Uber driver, even if you got enough money per trip to sustain that business it would not be a viable option for your clients (or you). The only reason to why space tourism and satellite launches are so expensive is simply because there has not been any way to re-use a rocket (except for the Space Shuttle that was decommissioned in July 21, 2011) and this has now changed. You can read more about the possibilities this gives space exploration on Spacex.com. I wrote a post about Spacex in 2017 about the potential they have and how they work with re-usability. One thing I would love to see in the future is to have people not usually interested in space exploration or space in general to acknowledge and getting more interested in the incredible work behind these rockets. We might not see this now but this launch is one small but important step for future science in medicine, environment, economy and overall stability in the world. SpaceX has had quite a year, or maybe a few years now with naysayers time after time proved wrong. The launch of the OTV-5 mission was another success in SpaceX relatively short history. For each rocket SpaceX successfully send to space, the potential cost of a transport to low earth orbit will be lower than ever before. This will prove to be extremely important for ambitious companies with space as a business. Today, the cost of sending satellites and humans to space is still a costly endeavor and the only way to lower the cost, today, is to use reusable rockets. SpaceX continuous work to re-use their rockets will lower the prices this will be extremely valuable, not only for SpaceX as a company but for every human being in the long run. Deep space mining companies don't have any choice but to follow SpaceX example. Space tourism will come as a bi-product of low cost launches and hotels in low earth orbit is starting to become a thing that actually can happen. Take a look at the launch of the OTV-5 mission. It is pretty remarkable how flawless it all looks and it's easy to understand how fast the prices will drop. SpaceX and/or Elon Musk decided to put up a video with the not so successful launches. That too is pretty interesting to watch, not because of the explosions but it gives you an idea of how many things can go wrong. Behind every successful launch (and landing) there are many many crashes, explosions and other mishaps. 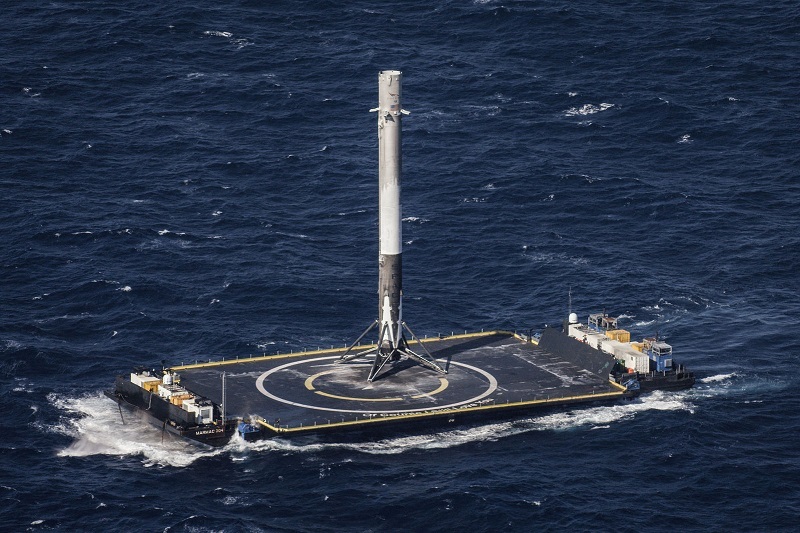 Update: SpaceX changes the mindset of not only the space industry but also the U.S. Air Force. In an article by Mike Fabey on SpaceNews, the U.S. Air Force take notice of the changes Space X is making and implements that in their own strategy while at the same time becoming more effective. If you want to find out more about Space X and their work, check their site or their social media channels: Twitter and Instagram. I will keep my eyes on SpaceX and update as soon as we have other breakthroughs happening. That breakthrough happened in early 2018 with the launch of Falcon Heavy. Here you'll find occasional updates about work, travel, politics and so forth. These are posts or articles about subjects I find important or are directly in line with my work or private interests. Feel free to comment, contact me directly via email or join the newsletter. Please see the FAQ before asking questions, chances are someone already asked me the same thing. Join the newsletter below for ideas and invites. No spam or annoying content. Interview: Hollywood politics after "Weinstein"